Several recent trends in the data were amplified this week. 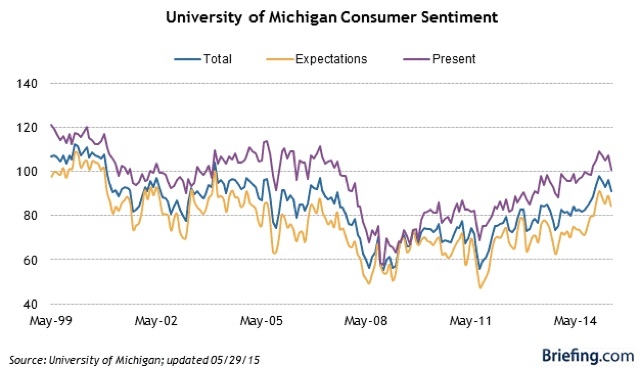 I have a new post up at XE.com, looking at two patterns of consumer spending that tend to turn near midcycle. Neither one suggests a recession is particularly close at hand. 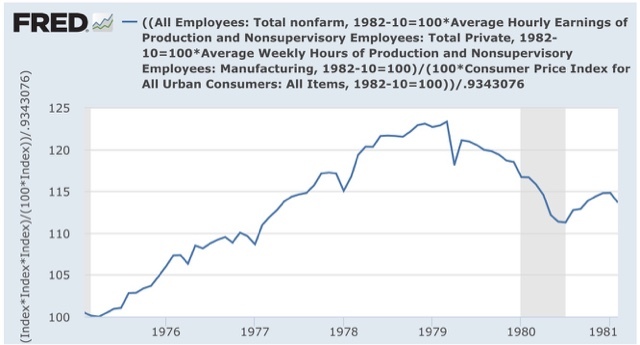 Every month we read stories about what a poor labor market recovery this has been. The latest articles were from Profs. Brad DeLong and Menzie Chinn. I respectfully disagree. 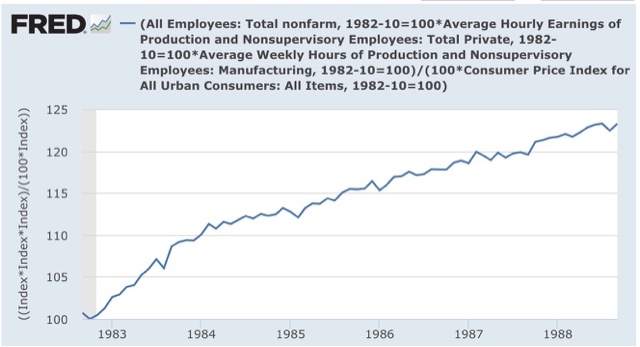 So why is it that most economic writers appear to think the defining element of a labor market recovery after a recession is the number of jobs created? So let's compare the increase in real aggregate wages -- the total wages paid to all nonsupervisory workers, adjusted for inflation, from their bottom in each recession. Since that was 5 years and 11 months ago for our current recovery, that will be our measuring stick. Quite a different, and I believe more accurate, measure than simply comparing payrolls. 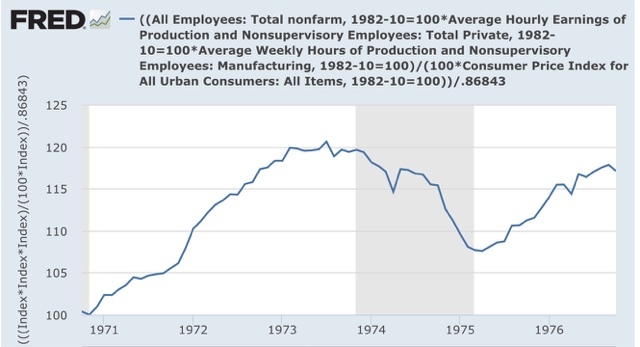 We can immediately see the effect of labor bargaining power, as all of the economic expansions before the 1980s showed far faster real aggregate wage growth than any expansion since. Also important are the big decreases in interest rates, such as coming out of the 1982 recession, and the impact of big changes in gas prices. The bottom line is that, measured 5 years and 11 months out from the bottom, this labor market recovery has been the third best of the 7 expansions, behind the 1960s and 1980s. This morning's retail sales report marks the demise of one of the two weak areas in the US economy. Last fall, there was a debate as to whether the decline in gas prices would be a net positive for the US economy, as an unambiguous positive for consumers (the majority view) vs. a negative due to impact on the Oil patch (Doomers!). Prof. James Hamilton of Econbrowser wrote that the weakness in the Oil patch would be more concentrated and sooner, while the positives would be diffuse and take place over a longer period of time. That's what has happened. 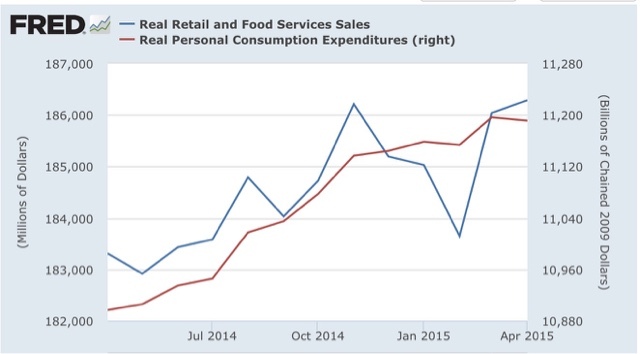 Not only are retail sales and real retail sals at new highs, but it is almost certain that per capita real retail sales also made a new high in May. This last measure is a pretty reliable long leading indicator, so it suggests the economy will continue to grow at least into the second quarter of next year. 1. there really was a bout of winter weakness due to unusually rough weather. 2. there has also been transitory weakness concentrated in the Oil patch, but as indicated by initial jobless claims, and as of this morning, consumer purchases, have outweighed that weakness. 3. take heart, Doomers! 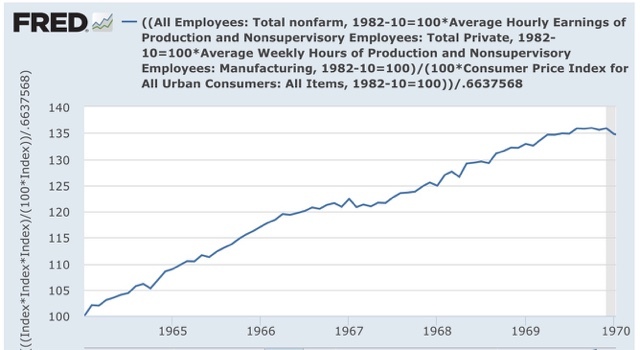 Industrial production still stinks, due to the overly strong US$. If you are seeing this, that means that I can circumvent the clusterfk of Apple's IOS 8.3 rendering Picasa inoperable, by using the Blogger App. I spent 3 hours at the Genius Bar at my local Apple store yesterday, after the latest upgrade for all intents and purposes turned my iPad into a brick. 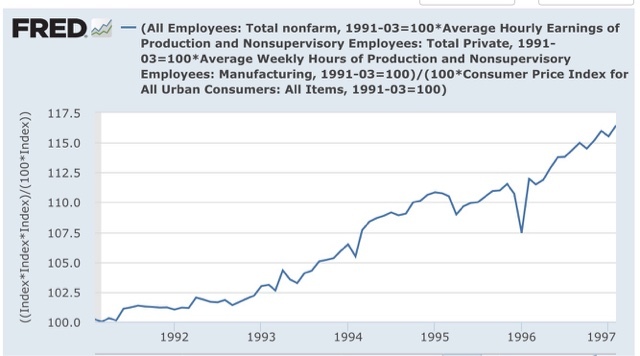 I have a new post up at XE.com discussing yesterday's JOLTS report. Although the number of job openings are soaring, my takeaway was decidedly cautious. So how tempting would it be to manipulate this monster [US treasury] market? Very, apparently. Turns out, the Department of Justice smells a rat in this until now pristine Treasury market, according to the New York Post ....And now that the probe by the DOJ has started some time ago, we can assume that a finely-honed flurry of activity has broken out at these banks ....In the process, Treasury prices, left to the vagaries of the markets, which have already been spooked by the Fed’s interest-rate cacophony and other factors, are beginning to swoon from their manipulated perch. Now, mind you, as far as I can tell Wolf Richter is basically Some Guy on the West Coast, but let's pass that. Last month I caught him cherry-picking trucking data, claiming that April trucking had "fallen again" from March, based on a misleading YoY comparison, despite a huge month-over-month gain shown in the actual data. As you can see, since their January bottom, and particularly since mid-April, they have risen about 0.75%. Oh, dear. It appears someone neglected to tell the British that it was US Treasuries were being manipulated, not Gilts, since they fell even more than Treasuries, by 0.85%. Now the Germans really have a right to be frosted. Despite the fact that the alleged manipulation was of US Treasuries, German bunds have unwound the most of all, rising about 0.90% just in the last month and a half! Much more than Treasuries, which only sold off by about 0.55% during that time. So, what might account for these moves? Well, let's look at the news from the last week in January. Did anything interesting happen? Well, first of all gas prices bottomed. This marked the end of the big deflation scare, which had dominated the Doomers at the end of 2014. Yields on U.S. Treasurys and German bunds hit 2015 highs on Wednesday, extending a recent government-bond selloff, after a wave of upbeat economic data highlighted the valuation concerns that have nagged investors for months. Wednesday’s price decline is the latest sign that traders and portfolio managers are once again recalibrating their expectations for the major Western economies and financial markets, following an early-year brush with deflation fears that briefly sent yields on 10-year German debt within range of zero. Now, the Pied Piper of Doom most likely will counter that he is merely a neutral, detached observer passing along an item of interest. Why, he isn't endorsing those views in the slightest! He reports, you decide. Bloomberg's. Or a sample from Business Insider. Just for examples. Copying and pasting complete copyrighted articles without permission from the copyright holder is absolutely prohibited by both this site's policies and copyright laws. Copyright infringement can expose both you and the site's owners to financial liability. Just don't do it. And if you see someone else doing it, please politely ask them to edit their diary accordingly. This is a bannable offense. Limited copying within the bounds of the doctrine of "fair use" is permitted. A reasonable rule-of-thumb is that copying three paragraphs from a normal-length news article or editorial is acceptable. (This, however, is not a safe-harbor. If even three paragraphs seems like "too much," then copy less or nothing at all.) For more on fair use, please visit this site. Yes, he always gets permission to post someone else's stuff. But, he been doing this for YEARS. Can't someone with his deep knowledge, capabilities and connections write an in-depth, well-researched and documented article on his own? I guess not. Finally, I would guess that because the editors of DK just love this guy to no end, the regularly let him ride up to the rules without any consequence. My two cents, inflation adjusted.